Not to be confused with Dimmitt, Texas. Dimmit County (/ˈdɪmɪt/ DIM-it) is a county located in the U.S. state of Texas. As of the 2010 census, its population was 9,996. The county seat is Carrizo Springs. The county was founded in 1858 and later organized in 1880. It is named for Philip Dimmitt, a major figure in the Texas Revolution. The spelling of the county name and the spelling of the individual's name differ because of a spelling error in the bill creating the county name. The area between the Rio Grande and the Nueces River, which included Zavala County, became disputed territory known as the Wild Horse Desert, where neither the Republic of Texas nor the Mexican government had clear control. Ownership was in dispute until the Mexican–American War. The area became filled with lawless characters who deterred settlers in the area. An agreement signed between Mexico and the United States in the 1930s put the liability of payments to the descendants of the original land grants on Mexico. 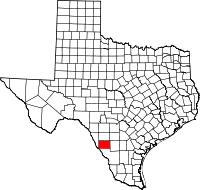 Dimmit County was officially established in 1858 from parts of Bexar, Webb, Maverick, and Uvalde counties. The county was organized in 1880. Carrizo Springs became the county seat. Early settlers found Dimmit County to be an abundant grassland with mesquite, oak, and ash trees and wildlife that included buffalo, deer, turkeys, wild horses, panthers, and javelinas. Artesian springs, bubbling up from a vast reservoir of underground water, fed into running streams that harbored giant catfish, crawfish, and mussels. Explorers found the area a good place to hunt wild mustangs, and to feed and water cattle. Pioneering cattleman Levi English settled Carrizo Springs in 1865 with a group of fifteen families from Atascosa County. Within two years, they were joined by a second group of settlers from Goliad County. Early dwellings were crude adobe structures or dugouts. In 1880, Levi English donated land for a county courthouse, schools, and churches in the town. Lawlessness, banditry, and in particular cattle rustling from both sides of the Mexican border, pervaded until the 1880s. Marshal J. King Fisher, managed to bring about a reduction in the lawlessness. King also staunchly enforced the "dry county" law once the residents voted to outlaw the sale of alcohol. Dimmit County's first producing oil well was found in 1943. In 1980, Dimmit County farmers earned about $20 million for their crops, while about $60 million in oil and gas was produced. Formation of the 1914 White Man's Primary Association was designed to exclude Mexican Americans from any meaningful participation in county politics. In the 1944 Smith v. Allwright case, the United States Supreme Court found the White Primary to be unconstitutional. D.C. Frazier drilled the first artesian well, which spouted forth gallons of water a minute, near Carrizo Springs in 1884. By 1900 about twenty-five artesian wells were flowing in the Carrizo Springs area, but most of the water was wasted, and very little was used for irrigation. Colonel J. S. Taylor introduced large-scale Bermuda onion and strawberry agriculture to the area, and was the first to use irrigation on a large scale in Dimmit County. In 1899, Taylor built a thirty-foot dam across the Nueces River to irrigate 2,000 acres (8.1 km2) of farmland. He also drilled a deep artesian well. By 1910, Taylor's methods were being imitated by a number of other developers and vegetable farmers. Irrigation helped make Dimmit County part of the Texas Winter Garden Region. By the 1920s, however, artesian water began to dry up. The necessity of installing expensive pumps drove many farmers out of business. By 1934, the United States Department of the Interior concluded that the existing water supply would not support substantial additional development. By 1965 only about 15,000 acres (61 km2) was being irrigated. Much of the land reverted to rangeland. The Big Wells Oil Field, east of Big Wells was discovered in 1969. The field produces from the Cretaceous San Miguel Formation sandstone underlying the Olmos Formation sandstone. The field extends north into Zavala. The Eagle Ford oil field was reported to be under development in 2011 with 3,000 wells projected to extract oil by hydraulic fracturing from tight shale formations. The oil play has improved business activity in the county but raised fears regarding the adequacy of water supplies as fracking requires injection of large quantities of water under pressure into wells to break surrounding rock. According to the U.S. Census Bureau, the county has a total area of 1,335 square miles (3,460 km2), of which 1,329 square miles (3,440 km2) is land and 5.6 square miles (15 km2) (0.4%) is water. As of the census of 2000, there are 10,248 people, 3,308 households, and 2,646 families residing in the county. The population density is 8 people per square mile (3/km²). There are 4,112 housing units at an average density of 3 per square mile (1/km²). The racial makeup of the county is 76.95% White, 0.88% Black or African American, 0.70% Native American, 0.66% Asian, 0.07% Pacific Islander, 18.23% from other races, and 2.51% from two or more races. 84.97% of the population are Hispanic or Latino of any race. There are 3,308 households out of which 42.00% have children under the age of 18 living with them, 57.40% are married couples living together, 17.20% have a female householder with no husband present, and 20.00% are non-families. 18.00% of all households are made up of individuals and 9.30% have someone living alone who is 65 years of age or older. The average household size is 3.06 and the average family size is 3.48. In the county, the population is spread out with 33.20% under the age of 18, 8.80% from 18 to 24, 24.70% from 25 to 44, 20.70% from 45 to 64, and 12.60% who are 65 years of age or older. The median age is 32 years. For every 100 females there are 94.30 males. For every 100 females age 18 and over, there are 91.10 males. The median income for a household in the county is $21,917, and the median income for a family is $24,579. Males have a median income of $25,000 versus $15,370 for females. The per capita income for the county is $9,765. 33.20% of the population and 29.70% of families are below the poverty line. Out of the total population, 40.30% of those under the age of 18 and 31.50% of those 65 and older are living below the poverty line. The county's per-capita income makes it one of the poorest counties in the United States. While the state of Texas went strongly for Republican George W. Bush in the 2004 presidential election, Dimmit County, a traditional stronghold of the Democratic Party, supported U.S. Senator John F. Kerry of Massachusetts, with 2,365 votes for Kerry to 1,188 for Bush. The last Republican to win a majority in Dimmit County was Richard Nixon in 1972. In 1892, Dimmit County gave all its few votes to Populist James B. Weaver, thus making it his leading county. From 1981 to 1988, the district attorney of Dimmit County was noted trial lawyer Julio A. Garcia of Laredo. At the time the office included Webb, Jim Hogg, and Zapata counties as well as Dimmit. ^ "Native Peoples of the South Texas Plains During Early Historic Times". Texas Beyond History. UT-Austin. Retrieved 17 December 2010. ^ "Distant Connections". Texas Beyond History. UT-Austin. Retrieved 17 December 2010. ^ Wishhart, David J (2004). "The Spanish and the Great Plains 1540–1821". Encyclopedia of the Great Plains. University of Nebraska Press. pp. 345, 346. ISBN 978-0-8032-4787-1. ^ a b c d e Leffler, John (2010-06-12). "Dimmit County, Texas". Handbook of Texas Online. Texas State Historical Association. Retrieved 17 December 2010. ^ Wranker, Ralph. "The South Texas Area". Retrieved 17 December 2010. ^ "Carrizo Springs, Texas". Texas Escapes. Texas Escapes – Blueprints For Travel, LLC. Retrieved 17 December 2010. ^ "Nature's Harvest". Texas Beyond History. UT-Austin. Retrieved 17 December 2010. ^ Leffler, John (2010-06-12). "Levi English". Handbook of Texas Online. Texas State Historical Association. Retrieved 17 December 2010. ^ Leffler, John (2010-06-12). "Carrizo Springs". Handbook of Texas Online. Texas State Historical Association. Retrieved 17 December 2010. ^ Adams, Paul (2010-06-12). "John King Fisher". Handbook of Texas Online. Texas State Historical Association. Retrieved 17 December 2010. ^ "321 U.S. 649 Smith v. Allwright". Decided: April 3, 1944. Cornell University Law School. Retrieved 17 December 2010. ^ Long, Christopher (2010-06-15). "The White Man's Union Associations". Handbook of Texas Online. Texas State Historical Association. Retrieved 17 December 2010. ^ Taylor, Paul Schuster (1981). Labor on the land: collected writings 1930–1970. Arno Press. p. 83. ISBN 978-0-405-14208-6. ^ Cindy, Wilke (2010-06-15). "Onion Culture". Handbook of Texas Online. Texas State Historical Association. Retrieved 17 December 2010. ^ Odintz, Mark (2010-06-15). "Winter Garden Region". Handbook of Texas Online. Texas State Historical Association. Retrieved 16 December 2010. ^ Layden, R.L. (1976). Braunstein, Jules, ed. Big Wells Field, Dimmit and Zavala Counties, Texas, in North American Oil and Gas Fields. Tulsa: The American Association of Petroleum Geologists. pp. 145–156. ISBN 978-0891813002. Wikimedia Commons has media related to Dimmit County, Texas.